There could be no better day for a test run on the new MJM 36z than Valentine’s Day, and it seemed our planets were perfectly aligned. Not only was the hull of our review boat appropriately red, but the entire MJM project hearkens back to a loving gift from company President Bob Johnstone to his wife, Mary. But I’m getting ahead of the story. MJM is the new whiz kid in the powerboat market, taking the field by storm with a series of delightful yachts that draw heavily on classic lobsterboats for their looks while tapping into the cutting-edge world of racing sailboats for their technology. 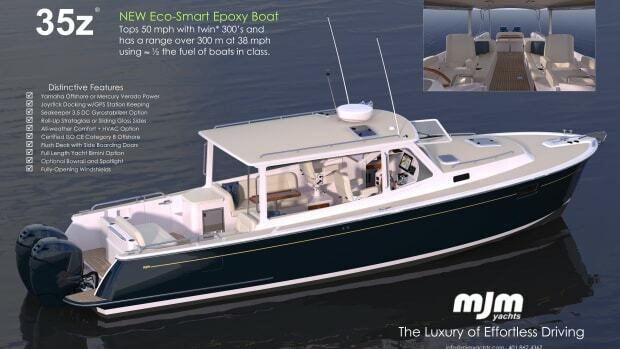 I won’t be giving away any secrets by saying that the MJM 36z is a masterful blend of fuel efficiency, speed, comfortable accommodations, joystick docking, and some very clever solutions to age-old problems. 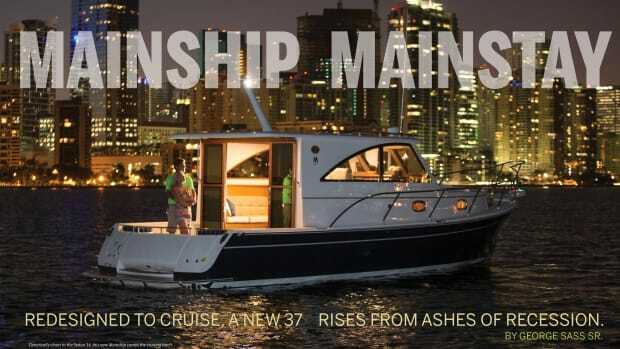 But you may be saying, this is PassageMaker Magazine, and the MJM 36z is a 34-knot express-style cruiser. What’s it doing here? 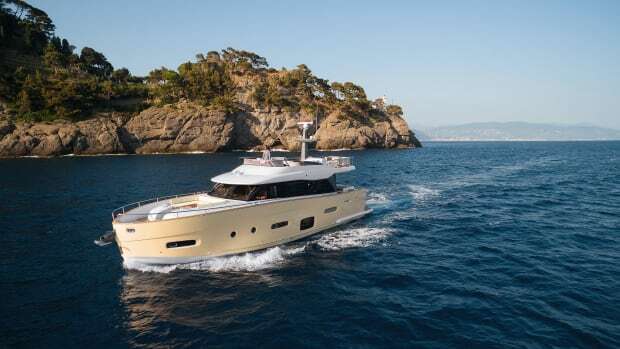 Well, the answer is simple: the MJM 36z is a cruising yacht so wonderful that the owners find themselves using it far more than any of the “cruising” yachts they previously owned. And paying a lot less at the fuel dock. No, this isn’t a yacht that is going to cross the Pacific, or one on which you can retire and live aboard in the Caribbean. This is a yacht for real people in the real world who may not have six months for an ocean voyage. This is a yacht that puts the fun back into yachting. Our test boat was headed for the Miami International Boat Show, but the Johnstones had had her trucked to the west coast of Florida before I stepped aboard in Palm Beach, and they’d had a wonderful time moseying north along the Gulf Coast, stopping at marinas, anchoring out, and socializing aboard with friends in the evenings. They were, to use an old cliché, smelling the roses along the way. After three weeks of nonstop cruising and meandering, which included crossing the center of Florida via Lake Okeechobee, they’d refilled the 200-gallon fuel tank. How can that be? For starters, the MJM 36z sips fuel at a rate that other builders only dream about. Fact: as we tiptoed through a manatee area at a bit over 5 knots, we were using just 1 gallon of fuel per hour. On a 200-gallon tank, that’s a range of about 1,000nm. 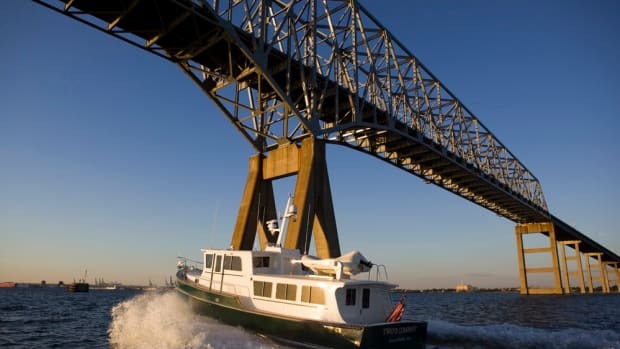 Once free of the low-speed area, we upped the ante to about 25 knots, a comfortable cruise for both occupants and diesels, and we were using only 13gph, getting about 2 miles per gallon. Startling numbers like those don’t just happen, so you need to know the whole MJM story. It started decades ago, when Bob Johnstone was first hooked on sailing, going on to race successfully and cruise actively with his growing family. In 1977, he and his brother, Rod, thought they could build better sailboats and launched a company named J/Boats with their ubiquitous J/24, of which more than 11,000 have been built. 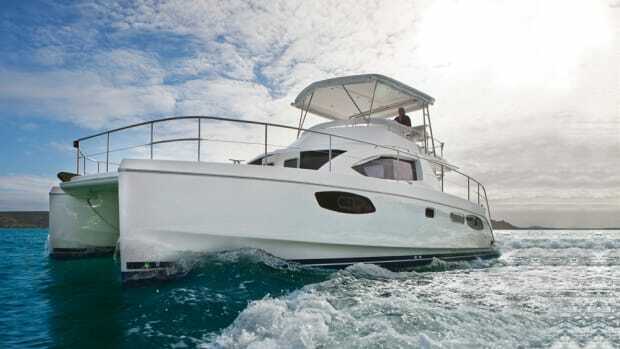 In the ensuing decades, J/Boats has built 35 designs up to 53-footers. In the mid ’90s, Bob presented Mary with a 40th anniversary gift: a Dyer 29, which they used to explore their home waters around Boothbay, Maine, and which was easy for Mary to run by herself while the boys were off racing. It wasn’t long before Bob took some drawings back to Dyer to improve the boat, and soon their modified Dyer was used not only for Maine summers but for Charleston winters, too. A few years passed, and again Bob had the itch to create the ultimate motorboat. Casting around, he settled on designer Doug Zurn, who had created the pretty Shelter Island 38 for singer Billy Joel. Fourteen rounds of emails later, Zurn presented a rendering that pleased Johnstone’s discerning eye. A racing sailor like Johnstone knows that weight and speed are opposites, so he took construction of the new boat to Boston BoatWorks, specialists in ultralight, ultra-strong racing yachts. And, oh yes—they came up with a name for the company: MJM. It stands for Mary Johnstone’s Motorboat. Tee hee. The hull that Zurn drew is very slippery, with a deep V forward and plenty of flare, like a Carolina sportfisher, to keep the bow from burying in a sea, while the aft 13 feet are a planing surface with an 18-degree deadrise. One of the design requirements was to keep the beam under 12 feet so the yacht could be trucked to new cruising areas without expensive road permits. And her height allows her to nip under most bridges on the Intracoastal Waterway, thus shaving hours off most legs. While the MJM 36z’s looks are classic, construction is high tech, with a hull of wet prepreg, vacuum-bagged epoxy/Kevlar/E-glass with Core-Cell foam for strength with the lightest overall weight. The boat is designed with a low center of gravity, which also helps it achieve the unlikely pairing of great fuel economy with a good turn of speed. Good construction isn’t just about the hull; it’s about the entire package. And it’s clear that Johnstone and Boston BoatWorks have drawn on their sailing experience, with husky handrails along the overhead and around the cockpit, plus aggressive nonskid anywhere you might step. When I first walked down the dock, the MJM 36z was “buttoned up,” with all the pilothouse windows covered by poly-mesh sunscreens that serve as privacy curtains to turn this area into a living room. Unlike most sunscreens, these are Velcro-mounted inside the windows so they stay dry and can be quickly rolled into a storage tube. This is the first stage of un-cocooning the 36, which leaves the full side and rear curtains in place for all-weather use. 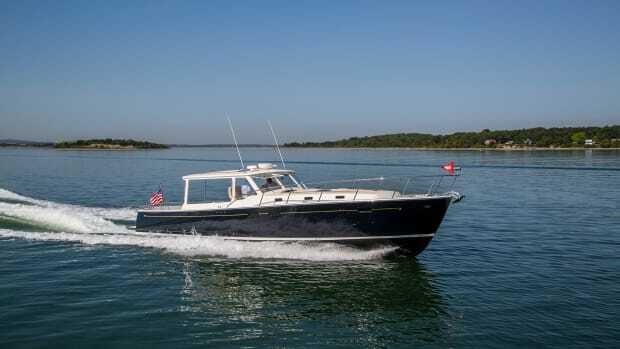 The pilothouse is both heated and air conditioned, and the aft entry has a screen for protection against no-see-ums, as do all the hatches. But, if you want, the pilothouse can have “all the fresh air of a flying bridge,” as Johnstone says. The curtains roll easily out of the way, and even the forward windshield hinges open to provide a flow of fresh air. The seating also benefits from MJM thoughtfulness. Stretched across the transom is a settee as comfortable as an Adirondack chair; two more seats face aft, and, in the pilothouse, two lounges run along each side. The two Stidd pedestal chairs revolve and lower, and—voilà!—there is seating for a dozen people without crowding. And, if you want to sleep two more guests or a couple of kids, the pilothouse settees convert into full-length berths. Immense bins are under the pilothouse seats, with enough space to tuck a couple of folding bikes for shore transportation, and mesh bags organize life jackets and other gear. This is true throughout the 36z: every possible space has been utilized for stowage. Bookshelves are inset into bulkheads, shelves fill the dead airspace in hanging lockers, and polyurethane bins are under the bunks. Another important design element (possible because the engines are aft) is that the entire cockpit sole, from transom to companionway, is one level. There are no steps to trip the unwary. But wait—there’s one more clever feature: boarding doors on each side of the cockpit make dock access as easy as stepping aboard. No more climbing over coamings. 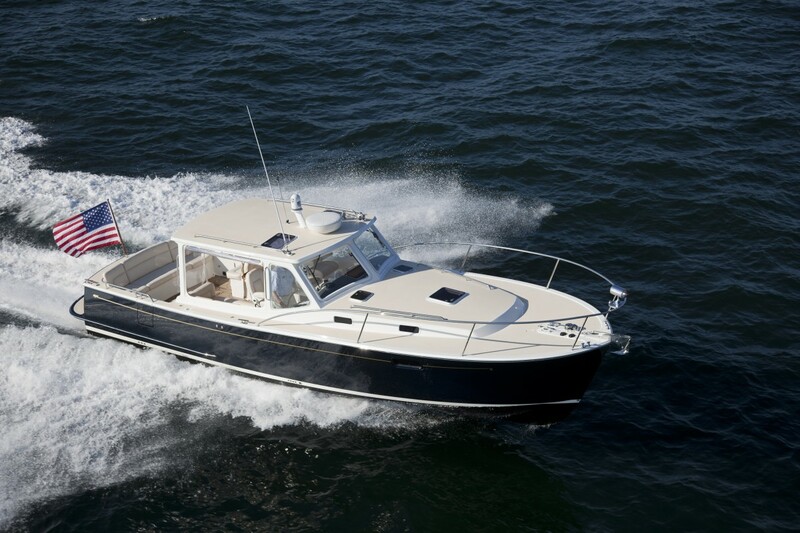 Two arrangements are offered in the cabin, and our test boat had the standard convertible lounge forward. With bolstered Ultraleather, this provides banquette seating for up to five people around a folding table. It’s also a great place for kids to watch the flat-screen TV when the adults are enjoying the cockpit. Another choice is a wide island berth with a 6-inch Memory Foam mattress, but, since the lounge can be converted to a double, I think that would be my choice. The galley is simple, with a microwave and a Princess electric cooktop, a stainless steel sink, and a very clever dual-opening fridge-freezer. Two drawer-style fridges pull out from under the counter, but there is also a hinged section in the counter that provides entry to the top drawer and to a large freezer bin next to it. This conserves the cold air by not allowing it to “fall out” when you’re getting something from the top fridge drawer. It also allows access to an insulated space under the drawers that’s large enough to hold a 10-lb. bag of ice. The head compartment is comfortably large and is equipped with a VacuFlush toilet that uses about a pint of water, so the 18-gallon holding tank will last a long time. There is ample room to shower and, with a soft-spray nozzle, you won’t soak the entire area, either. The yacht’s high-tech construction is just one of three major technological advances on the 36z. The boat was designed around a pair of Volvo Penta’s new D3 Aquamatic engines—electronically controlled, inline, five-cylinder, common-rail turbo diesels that meet the stringent Tier 3 emissions standards. The aluminum blocks take more than 1,300 lb. out of the stern, and, combined with the OceanX sterndrives, which have a titanium-ceramic coating and counterrotating DuoProps, the result is superb fuel economy and smooth operation. Volvo hasn’t yet named its joystick control system for its sterndrives, but it’s essentially Volvo’s IPS pod technology. At the push of a button, the joystick takes control from the conventional shifters, and the drives unlock to turn independently, giving the boat all the nimbleness of a pod drive. As we left our slip, Bob jogged the boat sideways a few feet and then spun her in her own length. No more docking stress. Access to the engines is equally well planned; the entire aft seat rises electrically to open all sides of the diesels and their systems. In a hatch under the cockpit sole is the 5kW Northern Lights genset, and there is still enough room for an inflatable tender, plus deck gear like lines and fenders. The third advance is in the optional electronics. The MJM 36z is the first boat ever to combine touch screens with thermal-imaging night vision. Using Raymarine FLIR night vision combined with HybridTouch displays (an E140W and an E90W), the separate control panel for the FLIR is eliminated, and the larger display is dedicated to night vision. The larger screen gives you a “window” to see where you’re headed, while the other keeps you on course with chart and radar overlay. Very cool stuff! Under way, the MJM 36z is nothing but fun. On a warm day with the side curtains rolled up, the hard top providing sun protection, and the windshield cracked open, it really was the best of all worlds. It feels, as Mary Johnstone said, “like a summer porch”—a flybridge without having to climb ladders. And yet it could be buttoned up instantly against a passing shower. Pushing the throttles forward only results in the water and wind moving past faster: the bow rise is almost imperceptible, and the 36z runs flat without tabs, leaving a minimal wake behind. We topped out at 33 knots (and just 24gph), and the handling was light and precise. Spin the wheel, and the 36z banks into a turn. Spin it back, and she centers up without a fuss. 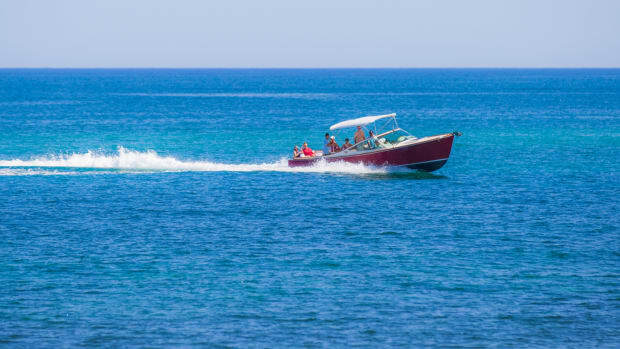 Remember what it was like when your dad let you zip around the harbor on your own in the Boston Whaler? Well, this is the grownup version, and believe me, it restores the joy. Other boats feel like driving a motor home compared to this little rocket. Conceived from a blank sheet of paper to satisfy a couple downsizing from a larger power or sailboat, or a young family growing into boating, the MJM 36z is so appealing and so much fun to use, it will rekindle your passion for boating. HOLDING TANK 18 U.S. gal.